Michigan Trails and Recreation Alliance of Land and the Environment, commonly known as MI-TRALE, is an alliance of multiple trail and outdoor recreation enthusiasts. We have working partnerships with both the Ottawa National Forest and MDNR involving equestrian opportunities. MI-TRALE has been awarded several grants for Equestrian Trail improvements. 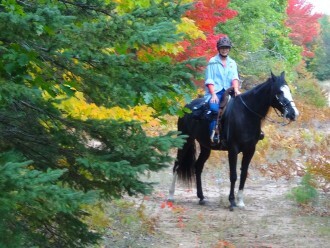 MI-TRALE volunteers work hard to provide what riding and equine camping opportunities we can in five counties of the Western Upper Peninsula. MI-TRALE is very fortunate to be located in the nearly one million acre Ottawa National Forest which provides a wide variety of equestrian opportunities ranging from well maintained and signed roads and trails to the more challenging cross country travel. 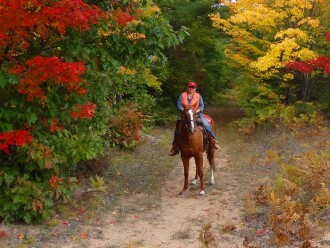 Except for the Sylvania Wilderness and specifically designated hiker only trails, including the North Country National Scenic Trail, the entire Forest is open to horses including open roads, closed, gated and blocked roads unless the road is specifically signed as closed to horses. Horses are not permitted in developed recreation areas. Many of the roads and trails on the Ottawa are open to other uses including motor vehicle travel, ATV¿s, ORV¿s, snowmobiles, hikers and mountain bikes unless otherwise specified. Roads and trails travel through a variety of management areas across the Ottawa National Forest. These areas are managed for a wide range of multiple use activities including recreation, threatened and endangered species, fish and wildlife, water quality and wood products. To help prevent erosion and impacts to threatened and endangered species, please stay on the roads and trails. Slow down when sight lines are poor. Watch and listen. Be aware of other trail users. Keep horses a safe distance from others. Speak to others and suggest how to safely pass. Clean manure from loading areas.